I stop and freak out a little. Whaaaaaaaaat. I'm actually serving a mission?! I already have my call?! How did this even happen. because it all happened so suddenly. I never planned on serving a mission. in the whole 19 years I've been alive. "Are you going to serve a mission?" The plain answer was "No". To be honest, I hadn't even thought about it! and it had never crossed my mind. One day it sort of popped into my mind but I was careful to keep these thoughts to myself for fear that if I let anyone know I would feel obligated to go. Quite honestly, it scared me to death thinking about serving a mission, and I needed to think about the pro's and con's in my head before I let anyone else think about it for me. For a few months I kept this idea to myself but I would think about it every day. It seemed like every lesson, devotional, talk, or conversation I had somehow related to missionary work and I couldn't ignore the fact that I needed to think more seriously about serving a mission. It was near the end of January when I told my parents. But no one else knew. I decided to keep it a secret because I wasn't 100% sure and I didn't want anyone to influence my decision. 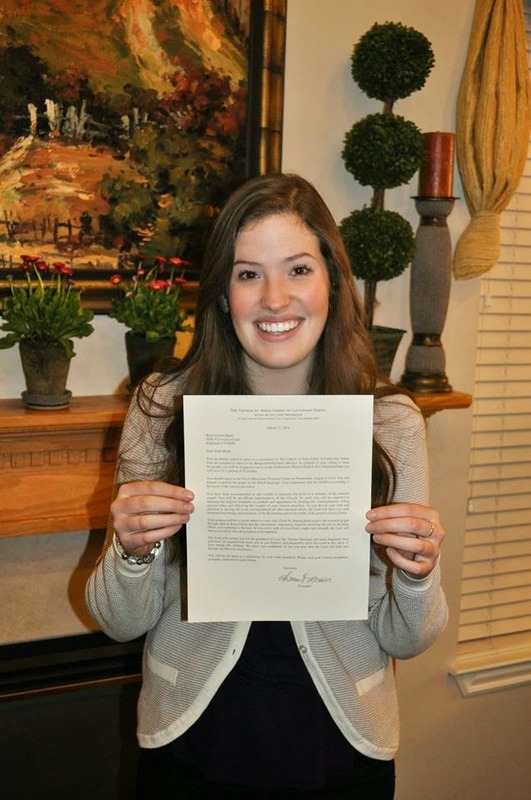 I wanted to be serving a mission for the right reason, and that reason was between me and my Heavenly Father. I escaped home for the weekend in mid-February so I could secretly start my papers with my home bishop. Only my parents and roommate knew. Everything went so fast from that point. I submitted my papers on March 3, 2014, and my call came the next week on March 12th. Since I wasn't able to go home to open it 'til the 14th, the next day was filled with surprise and anticipation as I called all 7 of my siblings and many of my friends. I will never forget the moment of opening that big white envelope. My whole body was shaking with so many different emotions, and I was trying hard not to read ahead. At that point, like many other future missionaries, I felt a sense of peace and I knew this is the place that my Heavenly Father wants me to be.